In Egyptian mythology, Nut was the sky goddess and the mother goddess of ancient Egypt. Egyptian artists often portrayed her as a woman arched over the earth god Geb, her twin brother and husband, with her fingers and toes touching the ground. Typically, her body was painted blue and covered with stars. Nut and Geb, the children of the god Shu (Air) and goddess Tefnut (Moisture), were born locked together in a tight embrace. The sun god Ra ordered Shu to separate them, so Shu held his daughter high above the earth, creating room between Nut and Geb for other creatures to live. In another version of the myth, Ra climbed onto Nut's back and asked her to lift him into the heavens. As Nut rose higher, she became dizzy, but four gods steadied her legs, and Shu held up the middle of her body. In this way Nut's body became the sky, and Ra attached stars to her. Angered by the marriage of Nut and Geb, Ra decreed that Nut could not bear children during any month of the year. Thoth, the god of wisdom, took pity on Nut and played a game with the moon—the regulator of time—that allowed him to create five extra days in the year. Because these days were not covered by Ra's decree, Nut was able to give birth to five children: Osiris*, Isis*, Set*, Nephthys, and Horus. 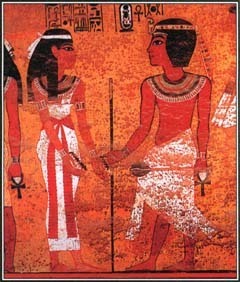 This painting from the tomb of King Tutankhamen in Thebes shows the Egyptian ruler with the sky goddess Nut. along Nut's body in a boat. When he reached her mouth, she swallowed him, bringing on the night. After traveling through Nut's body at night, Ra emerged again at dawn and brought on the day. In some myths, Nut plays an important role in the underworld, providing fresh air for the souls of the dead. See also Egyptian Mythology ; ISIS ; Osiris ; RΑ (Re) ; Thoth . Nut is also associated with the tides of the Nile. One of the Egyptian gods, and I'm drawing a big blank here, impregnates her every year and she then gives birth to the high tide. I really wish I could remember who it is but I'm sure you could figure it out. If not just E-mail me.